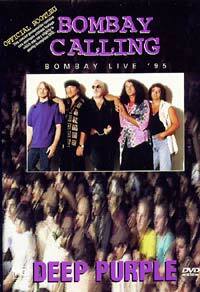 Although it's a fresh, energetic performance, the April 8th 1995 Bombay show is of greatest interest as a historical document, coming from one of an early batch of Deep Purple Mk 7 shows undertaken during the preparation for 'Purpendicular'. The recording was originally by Indian TV, who made an admirable job of it. It's a good, solid, multi-camera production which captures the wonderful atmosphere of the band's first visit to India. According to the sleevenotes, the tapes were discovered lying forgotten (what, after only four years??) in a cardboard box in November 1999. The master that Thames / Thompson had to work with doesn't get off to an ideal start. It begins with footage of a press conference. When the show kicks off with 'Fireball' the interview soundtrack continues. At that point I can no longer concentrate on what's being said, as my brain is screaming "yes, yes, get on with it!". When we finally do get the sound from the gig the band are already well into Fireball, but at least that's it, the production stays with the show through to the end. So, there's a full concert to enjoy, with Steve Morse bedding himself in to what is basically the 1994 Joe Satriani era set, which in turn was in effect a more imaginative version of the Come Hell Or High Water one. The picture quality is generally good, but does have artefacting on some camera angles, and one or two moments of picture interference near the beginning. The sound quality is very acceptable Dolby stereo, though it lacks the sledgehammer heaviness of Birmingham 1993. Three new tracks were featured in the 1995 shows. Of those, only 'Purpendicular Waltz' made it as far as India, and the version here is riveting, sounding bright and powerful. Way better than the studio recording, which is the only Purpendicular track that I've never managed to connect with. The dvd is more than just a piece of Deep Purple archaeology however, and stands as a fine show in its own right. While I've mentioned the promise contained in the one non-mk2 track, and the relatively interesting set-list, I feel I also have to balance things by pointing out that ten of the sixteen tracks were still in the Purple party selection performed in 2002. Even if Smoke on The Water is was by then introduced by a selection of other bands' riffs, and Highway Star by motorbike noises! The disc is Region 0 (all regions) and has been issued both as PAL and NTSC. The sound is Dolby stereo. Image ratio is 4:3 throughout.